So the other day, my hubs and I were talking Easter baskets. Let’s just say that my family raised me to be a bit of an Easter basket snob. Growing up, the bunny left J Bo and I gourmet chocolates from hometown favorite Sarris’ Candies and other goodies like bathing suits and flip flops. No plastic eggs and grocery store candy here. Last year, I ordered some chocolate from Sarris and had it shipped to Chicago for Easter baskets for Brady and reader Sacks. 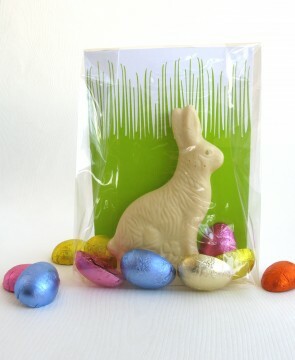 This year, I’m so happy to see the chocolate bunnies in my local grocery store – a total perk of moving back! Anyways, I LOVE this idea from Martha on how to spice up those chocolate bunnies and turn them into a sweet little Easter gift. How cute is this! 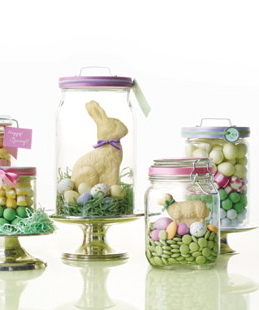 You can find glass jars like this at places like the Container Store, Dollar Store, etc.